This 30 Day Marriage Challenge is an easy way to get your relationship back on track. Sometimes, we get too comfortable in our marriage, and we forget that it needs to be nurtured. 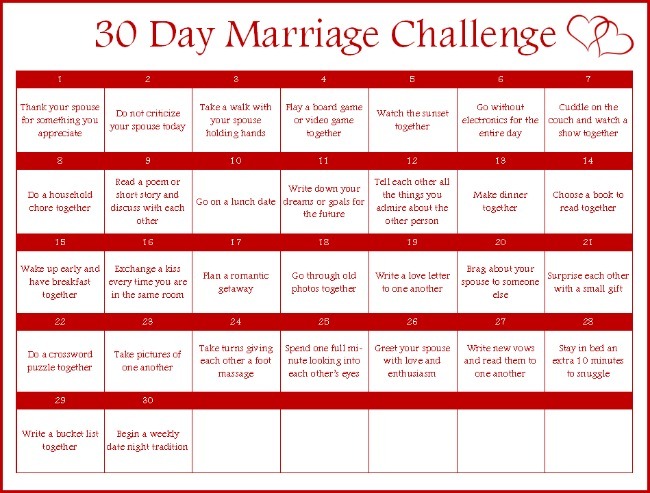 The 30-day marriage challenge is a cooperative effort. You and your spouse must agree to commit to the challenge together. Each day in the challenge includes a task or objective each of you must accomplish. Some of these things will be tasks you do FOR each other, while others are things you’ll do WITH each other. All of the tasks are activities that will help you connect with each other. Work your way through one activity each day. Go on a date night – Better yet, start a weekly date night tradition! Because this challenge forces you and your spouse to make time for each other each day in very simple ways, it should spark renewed interest in tending to your relationship. Each day is an opportunity to help your marriage grow and this challenge is a reminder of how easy that can be. Another great way to strengthen your marriage is to put forth the effort first, without waiting for your spouse to act first or with you. Try these 14 Ways to be an Intentionally Specific Wife or perform a Month of Acts of Kindness for Your Spouse and watch how your actions can transform your marriage.